Restless: Films and Other Works by Mircea Cantor, on view in the Amphitheater Gallery of the Museum of the Moving Image through May 6, is co-presented with the Romanian Cultural Institute New York. One way to approach Mircea Cantor's film Tracking Happiness (2009) is to recall Vladimir Nabokov's observation, in Speak, Memory, that the future might be nothing but "the obsolete in reverse." The choreographed procession of marking and erasure in the film seems to happen at the phantasmal center of history that Nabokov's phrase invites us to imagine: it transports us to the very point where the obsolete becomes itself—time past and the erosion of all things—to one side, while unfurling as the new to the other, to a point of convolution and reversal, where the resemblance of the past to itself mutates into dissemblance, only to return as likeness from the future. The film takes a conventional historiographic timeline and bends it into a loop, where the gesture is simultaneous with its deletion or withdrawal. (Obliquely, it suggests the same procedure could be applied to the messianic reflexes that still haunt cultural constructions or political scenarios predicated on apocalyptic scenarios, so that they exhaust themselves in agonizing pursuit of their projected destination.) The energetic residue produced by this pulsating core of history, its slight deregulations, generate centrifugal tensions, offshoots that propagate toward the places where winners and losers, martyrs and victims, the protagonists and extras of historiography are cast. Tracking Happiness is perhaps a Zeno paradox rendered as circular motion, where the first cause becomes identical to and overlaps with the last effect, while the distance separating them is segmented in myriad, incalculable instances and half-instances of uncertain historical position, chronological shifters that allow for endless exchange between the characters of historical becoming. 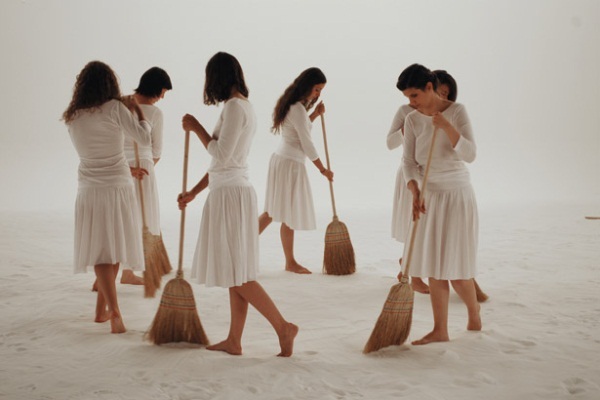 If this were an allegory, then Cantor's broom-wielding dancers could accompany, with their tragic chorus ritual, an intricate dialogue between Time and Truth, revealing themselves to each other and, to us, their complementarity. But maybe this is a quasi-, or non-allegory, a syntactic construction where something that could easily be mistaken for an allegorical site of enunciation is outlined, yet functions as backdrop for halted elucidation, and thwarted semantic transportation. An older video, Deeparture (2005), shows a wolf and a deer as they try and adjust to each other's presence in the closed space of an art gallery—almost motionless close-ups, troubled only by the double rhythm of breathing and barely perceptible muscular ripples, compose this still life in real time. The stage is once again set for allegorical clarification, whereby the uncomfortable co-presence of the two protagonists would mirror a victim-victimizer relationship elsewhere in the world, bring forth and illustrate a moral story. But instead of ethical release, what we have here is oppressive quietude, as if the most terrible question were muffled by its own urgency, by the intensity of the conditions that make it necessary for such a question to be asked. Another work, the photographic series Holy Flowers (2010), perturbs the allegorical dispositif at the same time that it appears to build it. 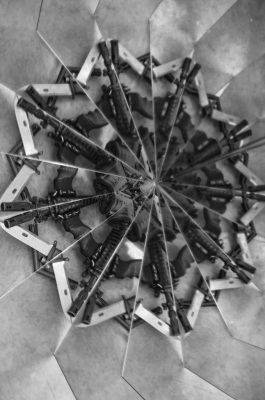 The way in which machine gun and mirror interlock, the seamlessness of their reciprocal reflection, could have prefaced an indictment of political brutality, an exposure of the ideological processes through which "us" is separated from "them" and war is declared. Yet the formal rigor with which the two elements intertwine allows for a "technological" reading: perhaps machine gun and mirror interlock in a camera, a device to select, stage, view, register, and archive an immense number of selves. Rather than expanding our own perspective, perhaps Holy Flowers puts forward a blind spot: the glimpse of a viewing device directed at us, a viewfinder for which we are the vanishing point. 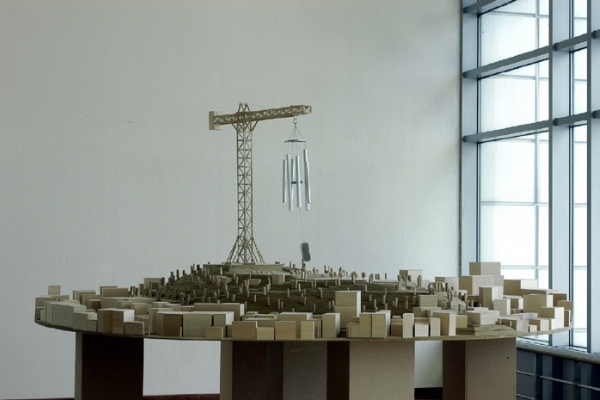 Cantor's Monument for the End of the World (2006) is a model of the Korean city of Busan, above which a wind chime, suspended on a crane, towers menacingly. At the scale established by the work, only a cataclysm could set the chime into sonorous motion, yet the same cataclysm would wipe out the life of the city. A symbol of domestic comfort transformed into a warning of collective obliteration, the chime replicates in a different paradigm the ambitious vertical thrust promised by Tatlin's model for a Constructivist tower to the Socialist International. Similarly it disregards what can be built and what can be seen by a group of people, rather than by the Angel of History. Yet something is purposefully amiss in the Tatlin analogy suggested by the work, something that has to do precisely with scale and its inversions. Instead of a confident push upward (Tatlin's model measured almost 4 meters), Cantor's work is scaled down in relation to the ready-made, regular-size chime. The apocalyptic overtone is confused with the connotations of idyllic domesticity. Rather than Modernist, revolutionary escalation, Cantor's retro-futurist piece recalls the set design for an old science-fiction film, with tiny housing blocks being thrashed around by doll-size monsters. The reduction of the cityscape and the resulting disproportion of an otherwise standard chime deflate the destructive projections in science fiction, the narrative euphoria with which the world is rendered powerless at the hand of immense beasts it has created or unwittingly conjured. Conversely, the toy, and the set of gestures associated with toys, are inscribed into the monument. There is an oscillation here between the heedless metaphors of Modernism—Constructivist or sci-fi—and their interrogative suspension, to-ing and fro-ing between images of social renewal, impending doom, and the space of privacy and subjectivity, catastrophic tremor and domestic peace. In yet another vacant allegorical landscape, the work engages what seems to be our learned inability to conceive of the distant future other than in symbolic terms: the future occurs where the causal chain is interrupted by the arrival of a deus ex machina, be it alien invasion, the gridlock of over-consumption, or the self-annihilation of our technological advancements. Vertical Attempt (2009) looks at a moment of discovery and imagination, of verifying the functionality of instruments (scissors) and the properties of substances (water) in poetic usage—or possession, one that owns without immobilizing, or grasping. Like a sudden intuition, the gesture of the child cutting the water with a pair of scissors is extracted from everyday continuity—from a series of experiments children perform to ascertain their place in the world—and looped. Yet the significance of the work resides as much in the gesture itself as in the heavy darkness that punctuates its repetition, a protracted fadeout that functions like an accumulation of antonyms to the child's play, of everything that is not play, that could negate or suspend it. In what could be called Cantor's "horizontal attempt," The leash of the dog that was longer than his life (2009), the camera follows the leash of a dog that never seems to end, or to end in cinematic non-time. The leash that ends in the enjoyable picnic setting where the film begins (and from which it hastily departs) is longer, the title tells us, than the timeline of the dog's position as actor in the film. An impossible threshold, both in and out of film, and in and out of life, is visualized in an over 20-minute marathon of protraction, where each link in the chain could correspond to yet another moment in the dog's existence, and the film's continuity. These correspondences come progressively undone in a grueling journey into disconnection, with the last scene appearing as a spectral recuperation: a ball lost by the dog's owners in one world is recovered in another. Two scripts are reconciled in the same film, a film that, were it played backwards, would preserve the relations it establishes between premises and denouement, its oscillation between worlds—disjunctive, but alike. Mihnea Mircan is artistic director of Extra City Kunsthal, Antwerpen.